Two teenagers, both seriously injured a week apart while playing hockey, remained hospitalized on Sunday at Hennepin County Medical Center in Minneapolis, where their family members anxiously watched their every movement, hoping for signs of improvement. Jenna Privette, an 18-year-old senior at St. Croix Lutheran High School in West St. Paul who was injured on Friday, was in satisfactory condition, still unable to move her legs or feet and still experiencing pain and tingling in her arms, according to her father, Dan Privette of Burnsville. "There hasn't been a lot of change," he said on Sunday, although an MRI showed no breaks in her spinal cord. She will undergo further testing. Jack Jablonski, a 16-year-old Benilde-St. Margaret's sophomore paralyzed on Dec. 30 after a check from behind that severed his spinal cord, had his feeding tube removed on Saturday, ate his first solid food -- cheese pizza -- and was lifted into an upright position for a few minutes. "He's been lying on his back for seven days, and he did very well," said his father, Mike Jablonski. Jablonski, who has been told he will never walk or skate again, has regained some movement in both his shoulders and upper arms. "Moving his arms -- that's huge," said his father, who planned to spend Sunday decorating his son's hospital room with NHL jerseys sent to him in an outpouring of sympathy and support from the hockey world. The family has been heartened by the small improvements in Jack's mobility, as well as by seeing his spirit returning. "All of a sudden we got Jack back. He's talking. His personality is there," Mike said. "With all the meds, he was so groggy. I told him, 'You've got a lot of people pulling hard for you.' The hockey community, and the community in general, has been beautiful." But while his slight gains in mobility are positive, "it doesn't change the fact that the spinal cord is completely severed," said Dr. Tina Slusher, pediatric critical care doctor at HCMC. "With various devices, he will have some use, and even a little movement means you can do a lot more. Still, we're not very optimistic about a lot more return in function." If Jack's progress continues, he probably will be moved to a rehabilitation facility within the next week or two, Slusher said. Privette's prognosis is unclear, although her injury appears less severe than Jablon-ski's. "She's had an MRI, and it did not show breaks in the spinal cord, which makes it different than Jablonski's [injury]," said Carl Lemke, athletic director at St. Croix Lutheran. "It's an injury she's had in the past. Hopefully, it will improve." Dan Privette said his daughter was injured once before, in eighth grade, when she also lost feeling in her legs. This time, she was playing in a game she had dedicated to Jablonski when she was hit from behind and fell face down on the ice. "It happened right in front of me," her father said. The two high-profile incidents have sparked debate about how the game should be played, coached and officiated to best protect the safety of young players. 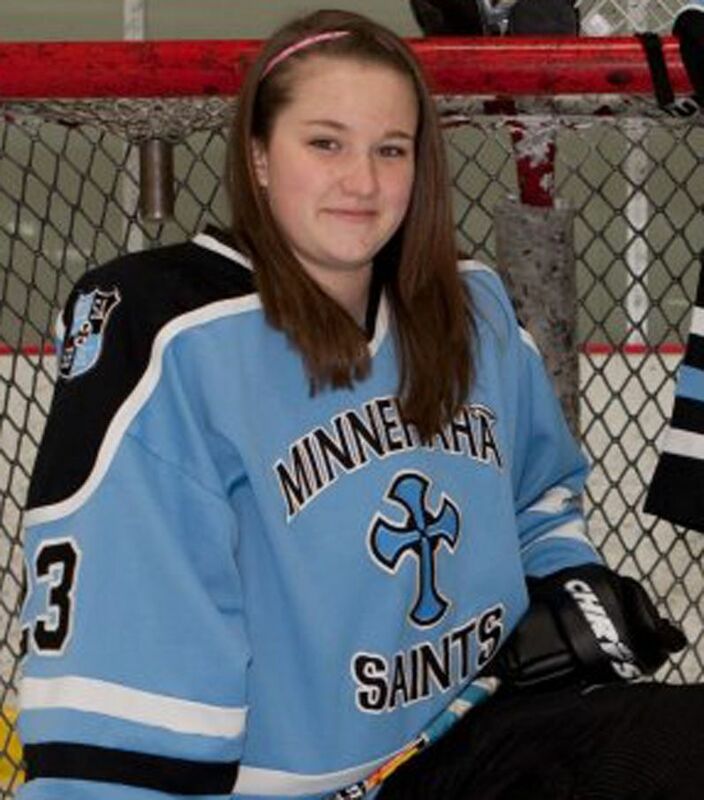 Checking is not allowed in girls' hockey, under Minnesota High School League rules, yet Dan Privette said that he saw his daughter checked from behind and that the player who delivered the check did not receive a penalty. Checking is allowed in boys' hockey, although not from behind, at the bantam and high school levels. Until this season, checking also was allowed for younger peewee players. A ban was implemented last year. That ban, imposed by USA Hockey, has been controversial in Minnesota, the one state that opposed it. Critics say players should learn proper techniques for giving and receiving a check at the peewee level or risk more severe injuries at the bantam level when players are bigger, faster and capable of inflicting more damage. Mike Jablonski doesn't think checking should be banned, but he hopes that one result of his son's injury is stricter officiating. "Checking 10 to 20 years ago is different than it is now," he said. "You can't be hitting people blindly into the boards. Let's make this a finesse game of speed and skill." Even before the recent injuries, Todd Cocallas, board member for the Eden Prairie Hockey Association, was calling for stricter officiating. His son, a bantam, suffered a concussion this season when he was crossed-checked from behind and sent face-first into the boards. "The kid didn't even get a penalty," Cocallas said. "He should have been kicked out of the tournament. Kids have got to be taught that this is not OK."
But unnecessary roughness in hockey is part of a bigger issue for the sport, said Hal Tearse, who trains coaches for Minnesota Hockey and coaches at Providence Academy in Plymouth. "It's watching fights on the Internet, with the 'hit of the week' and the 'fight of the week,'" he said in an interview before the recent injuries. "We continue to glorify the parts of the game that are extremely dangerous to the participants."